Hey guys. I've been having an issue with my audio on one of the songs I'm working on. I previously finished the drums, previewed it and it sounded fine on the Wii (Dolphin). Now that I finished the guitar part for the song, the audio seems odd, like it's set to stereo but only playing through 1 speaker or something. And it's cutting in an out. I have below a video on what I'm trying to explain. There's 2 clips, the first is what it sounded like before I began working on the guitar parts. Thankfully I had recorded the drum playthrough before hand . The second clip at about 18 seconds in is what it sounds like now. It sounds like this regardless of whether I'm playing guitar or drums, in quick play or practice. 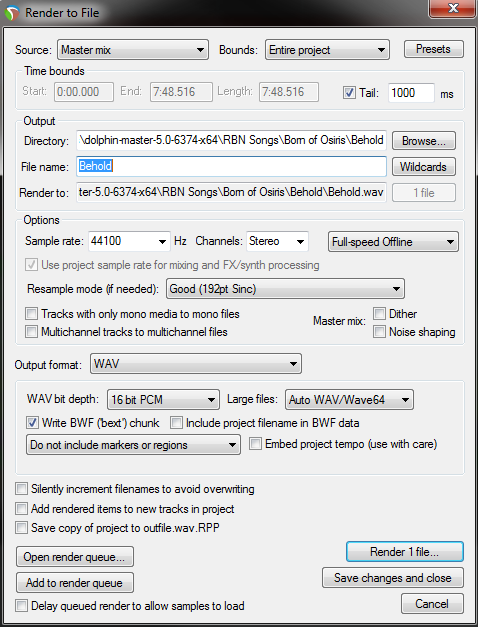 Just as a test, I downloaded a chart from the database here that had multiple instruments authored (Obzen by Meshuggah), and there were no audio issues that I could hear. This leads me to believe that I made an mistake somewhere, rather than it being an issue with emulation. 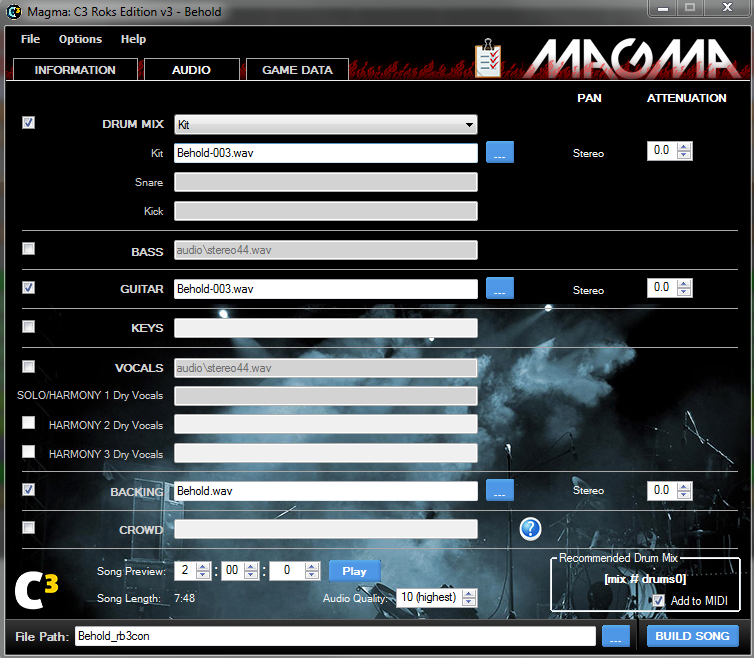 C3 audio tab. Behold-003 is the muted WAV file. I'm not sure what I'm missing here guys I would appreciate the help! I'll try what you suggested when I have time to test it out again. Question though: Wouldn't this also be an issue for the multiple charts I've done with just drums? I have about 8 drum charts with no audio issues (no crowd tracks). Either way. Thanks for the advice. I'll add crowd tracks in the future just in case. When you do two instruments/charts it requires you to put a silent file in crowd or the audio gets messed up. The audio encoder, rather than Magma itself, finds 3 audio tracks and thinks "OMG it's a 2.1 audio configuration! Quick, let's use the third track (backing) as the low-frequency track in a 2.1 configuration". And then hell ensues. Not 5.1 instead? 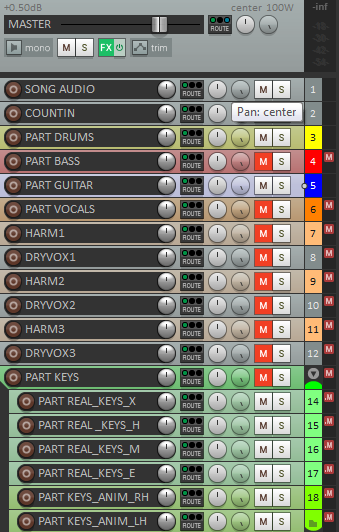 3 stereo audio tracks is 6 channels, so that makes more sense to me. It's possible, point is, it only happens in this specific configuration and specifically the background track gets assigned to low frequencies. I believe that is the first time I have ever heard this phenomenon explained. Thank you!! Now it actually makes sense. Leave it to the master to drop some knowledge on us. Yeah looks like this fixed the problem. Thanks guys! Been worrying about this for a few weeks now. Electronic Drums and Real Drums Playing Same Part - Both on Drums Tracks or Electronic on TRKS?